Product prices and availability are accurate as of 2019-04-19 07:10:48 BST and are subject to change. Any price and availability information displayed on http://www.amazon.com/ at the time of purchase will apply to the purchase of this product. With everything you need to make your Pear Training Intelligence system completely functional, this kit will help you kick start your training and get in shape quick. Works with Pear Intelligence Training app for iPhone (4s and up) and Android (running OS 4.3 and up with Bluetooth 4.0). Advanced Bluetooth heart rate monitor measures your bodyâ€™s response to a workout. Delivers real-time audio coaching through the Pear Stride earphones to ensure you train at the right intensity. Pear Stride earphones feature the exclusive Earlock by Surefire Retention System (used by Special Forces) to ensure a secure and comfortable fit. 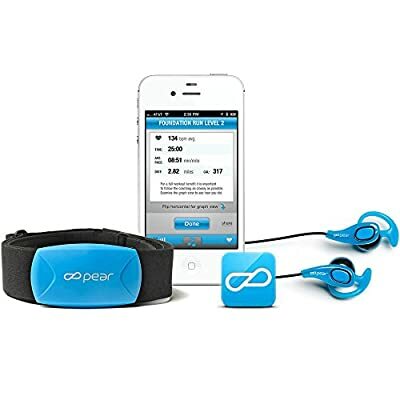 Kit includes: Pear Bluetooth wireless heart rate monitor, Pear Stride earphones, Earlock ear pieces (small, medium, and large), and a nylon ripstop gear bag to keep everything together.